How Do I Disable Retrace for .NET? 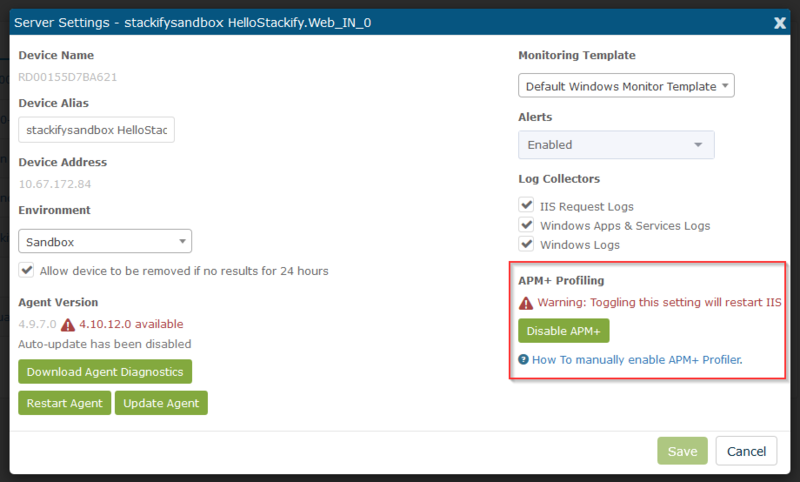 In the event you want to disable Retrace's .NET profiler and APM features on a server, but want to continue monitoring the server and the apps on it without profiling, just follow these simple steps. First go to Server Settings for the server that is running APM that you wish to disable. Simply click the Disable APM button to disable APM and to restart IIS. Once IIS restarts, it will no longer have the Retrace APM Profiler attached and you will stop seeing APM data in your application dashboard. The CLR will still attempt to load the profiler and immediately fail, but will continue to load your app and run it as normal, without profiling. This event will be logged to the Windows Event Viewer. Retrace's profiling is done within your .NET process and the data is then collected by our Windows service. It takes two different components. If you stop the Stackify Monitoring Service, after a few minutes the profiler that runs within your .NET process will stop outputting data. It senses that the Windows service is not running and it stops instrumenting your application at runtime. This will reduce the instrumentation overhead on your .NET process when it stops.